Passengers were delayed by an average of 18 minutes at Gatwick Airport. London Gatwick is the UK airport where passengers face the most delays, according to new data. Information from the Civil Aviation Authority analysed by the BBC showed that from January 2015 to March 2016, passengers were delayed by an average of 18 minutes at Gatwick. The average delay by flight was higher than any other airport in the UK. The service with the most problems was a Pakistan International Airlines flight from Manchester to New York's John F Kennedy Airport, which was late on eight out of 10 recorded flights in 2015, and delayed by an average of 88 minutes. A spokeswoman for Gatwick Airport told the BBC: "We regret any delays our passengers experience however several incidents beyond Gatwick's control influenced the airport's performance during this period, including numerous air traffic control strikes across European airspace, impacting the airport's whole flight schedule including our long haul routes. "Gatwick has more flights to Europe than any UK airport and can therefore be impacted disproportionately by events on the continent." At London Heathrow the average delay was 13 minutes. The ranking comes after the airport said it had had its busiest single month in its 80-year-old history in July, with 4.6 million passengers passing through its doors. Taking out trusted travel insurance can prevent passengers being left out of pocket should their flight be delayed or cancelled. Gatwick Airport has announced it the formation of a new board to study the impact of a second runway. 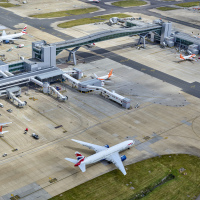 The airport said the Gatwick Growth Board (GGB) will examine the economic and social impacts of the airport's future growth and expansion plans on the local area, the South East, and on the economy of the UK. The work of the board, which will be co-chaired by Tessa Jowell and Steve Norris, will extend across an initial two-year period and will deliver regular reports and studies to Gatwick. The airport's CEO Stewart Wingate said: "Gatwick has invested billions to realise our transformation to this point. "We have great plans for further growth in the future and it is now clear that only Gatwick can deliver the runway that the UK needs." A poll in July showed most MPs believe a third runway at Heathrow is the major infrastructure project that will benefit the UK economy the most. More than half (55%) of them ranked expansion of the west London hub as the first priority compared with just 14% who chose a second runway at Gatwick.